My uncle Ben moved away when I was a baby and I don't remember ever seeing him, I just knew he moved to Texas so I am not sure about the dates for him. My uncle Dave died in Poplar Bluff while I was living there. HE was run over by a dump truck not far from our house. There is a problem with Nancy Barnes. She was living with my grandmother until after I married and left home in 1968. My mother, grandmother and I used to take her places with us and the last time I remember seeing her was in 1969. I didn't even know she was a sister to my grandfather until 3 years ago when I fond a census record saying she was sister to head of house. All we ever called her was 'Ole Indian Nancy". My sister was also shocked when we found out she was related. On the 1860 and 1880 census none of those names are any of my family so it isn't the same Alexander. 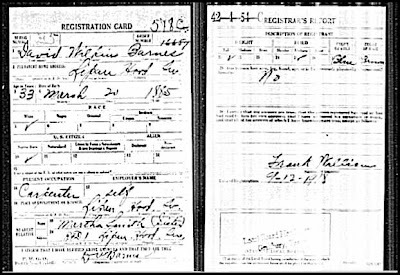 So, some additional information to show that the David Wilken Barnes who was from Texas WAS her uncle is shown in his WWI Draft Registration card. Notice he lists for his nearest relative as Martha Smith, his sister. This is the Mary Martha E. (Barnes) Smith who was married to James M. Smith and daughter of Alexander Barnes. And she was in Hood Co, Texas, where she, James and Lucretia Barnes are all buried. Also, the "Old Indian Nancy" "Jane" mentions now could not possibly be her grandpa's sister. 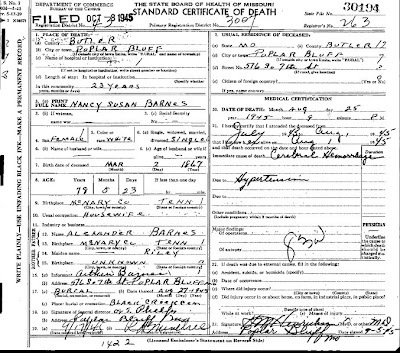 Per this death certificate for Nancy Susan Barnes, sister of Arthur Alexander Barnes, she died in 1945, and before Arthur since he is the informant on her death certificate. 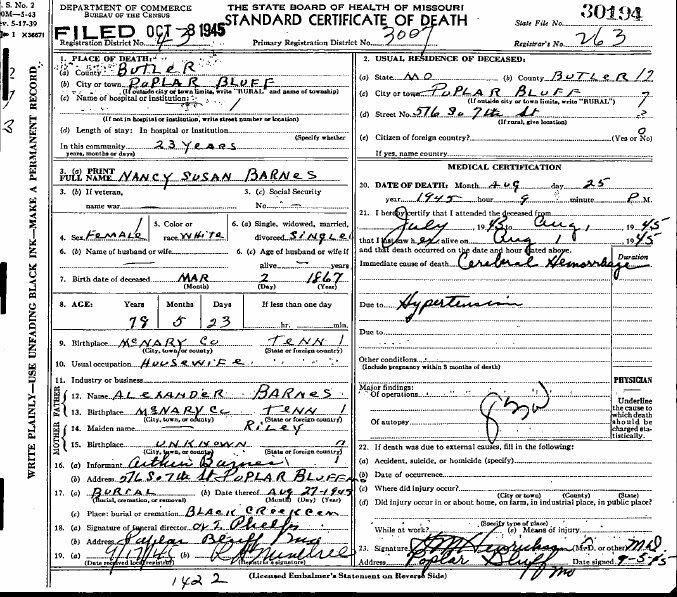 Per Jane's information about her grandpa, she was only one year old when he died, therefore, she could not have known or remembered a woman who died 10 years prior to the death of her grandpa. 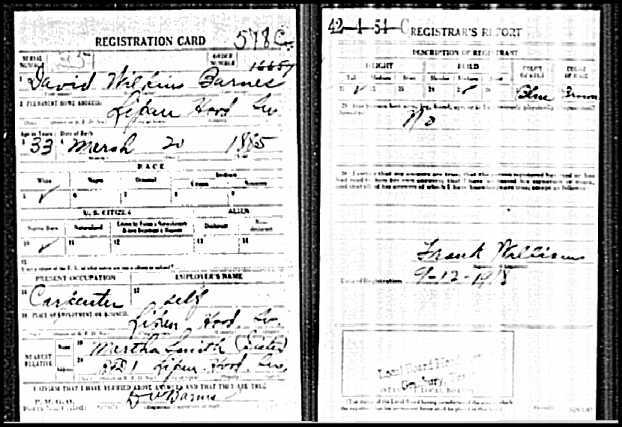 Maybe she did know a woman named Nancy, but it was not the sister of Arthur A. Barnes, her grandpa. So, the saga continues. Like I have said before, a wannabe will never accept they are not Cherokee, no matter what the evidence shows.They just keep changing the story as they go along.